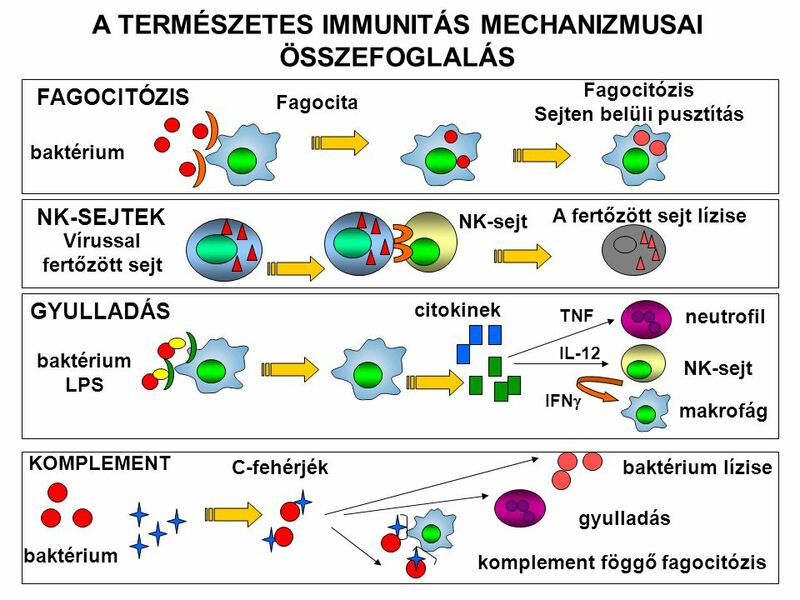 felszabadlása szeptikus sokkhoz vezethet Szeptikus sokk A TNFα (és IL1) lokális termelése véd a fertőzés ellen, de szisztémás felszabadulása halált okozhat Vérnyomás Disseminated intrvascular coagulation The panels on the left describe the causes and consequences of the release of TNF-α within a local area of infection. 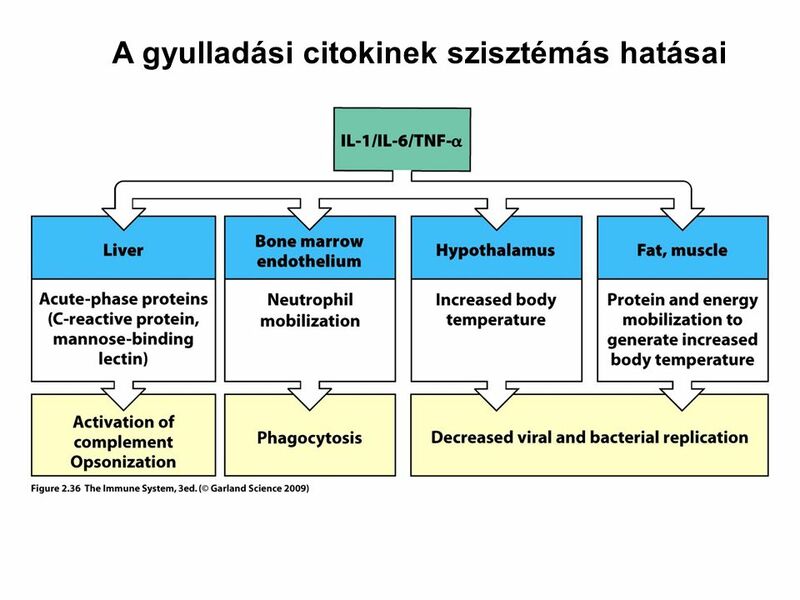 In contrast, the panels on the right describe the causes and consequences of the release of TNF-α throughout the body. 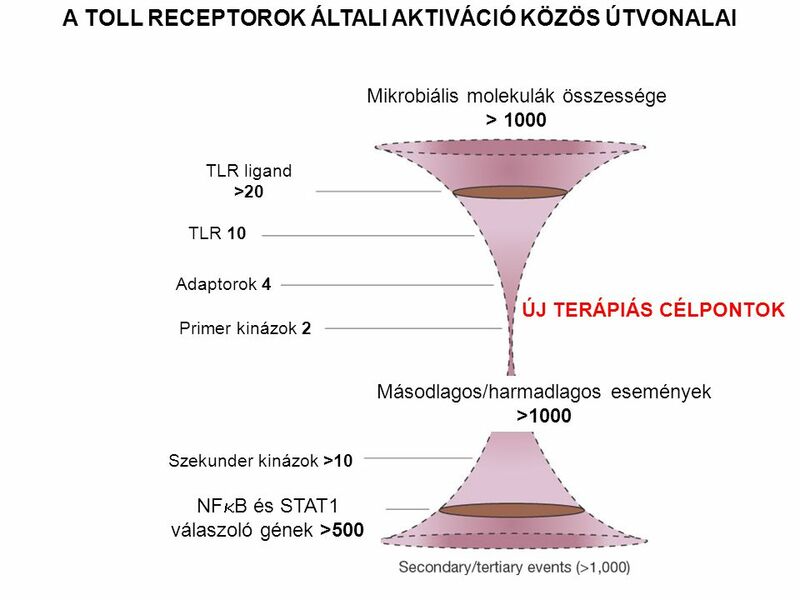 The initial effects of TNF-α are on the endothelium of blood vessels, especially venules. It causes increased blood flow, vascular permeability, and endothelial adhesiveness for white blood cells and platelets. 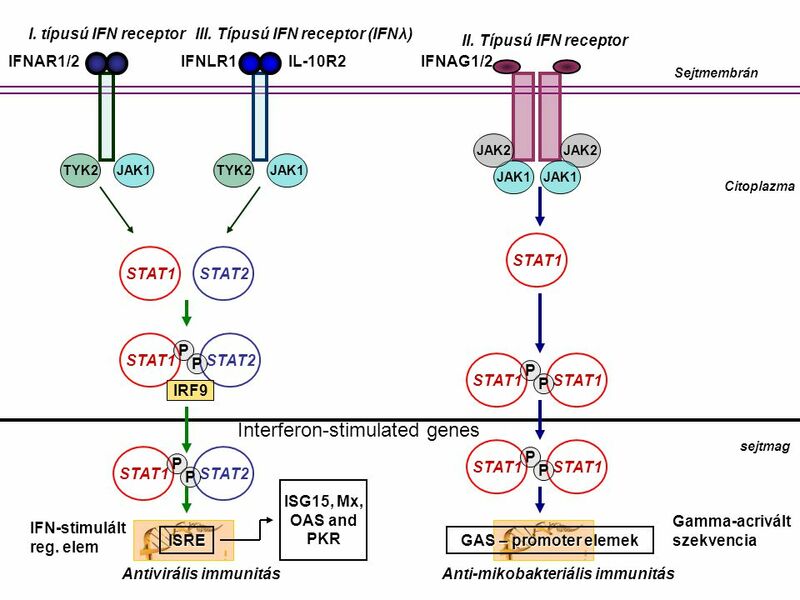 These events cause the blood in the venules to clot, preventing the spread of infection and directing extracellular fluid to the lymphatics and lymph nodes, where the adaptive immune response is activated. 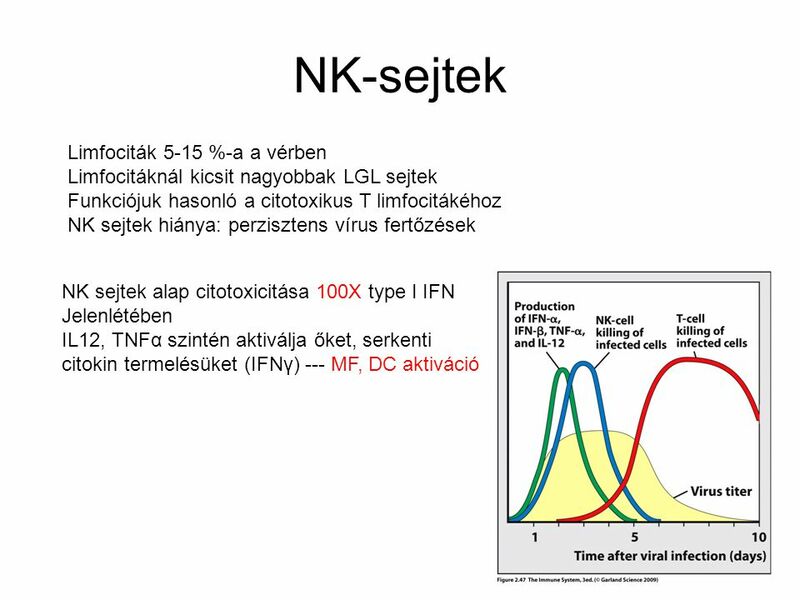 When an infection develops in the blood, the systemic release of TNF-α and the effect it has on the venules in all tissues simultaneously induce a state of shock that can lead to organ failure and death. H, heart; K, kidney; L, liver; S, spleen. 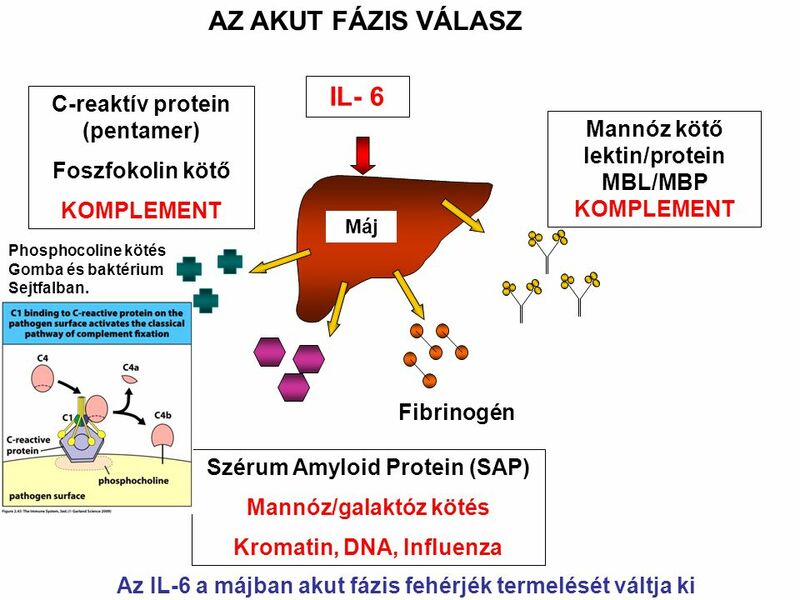 A gyulladási citokinek által aktivált endotélhez a neutrofilek kitapadnak majd a szövetekbe lépnek (extravasatio) Inflammatory mediators and cytokines produced as the result of infection induce the expression of selectin on vascular endothelium, which enables it to bind leukocytes. 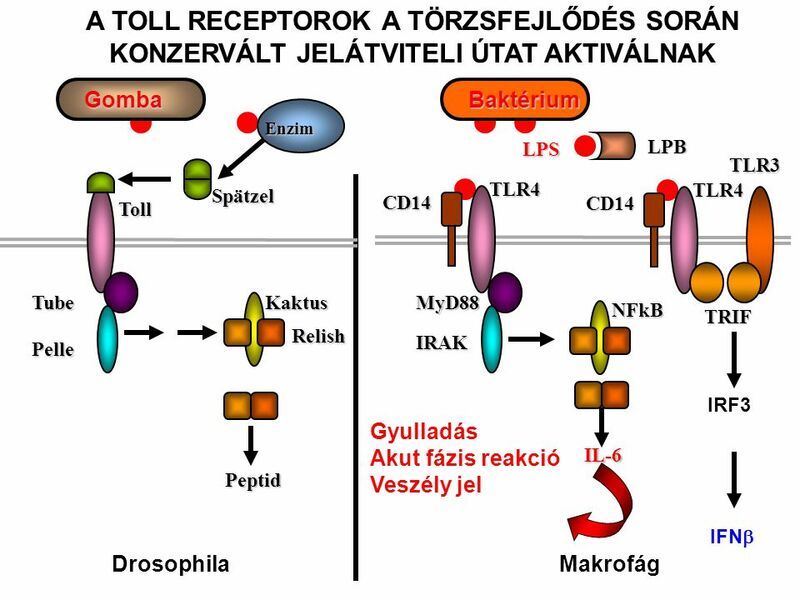 The top panel shows the rolling interaction of a neutrophil with vascular endothelium as a result of transient interactions between selectin on the endothelium and sialyl-Lewisx (s-Lex) on the leukocyte. 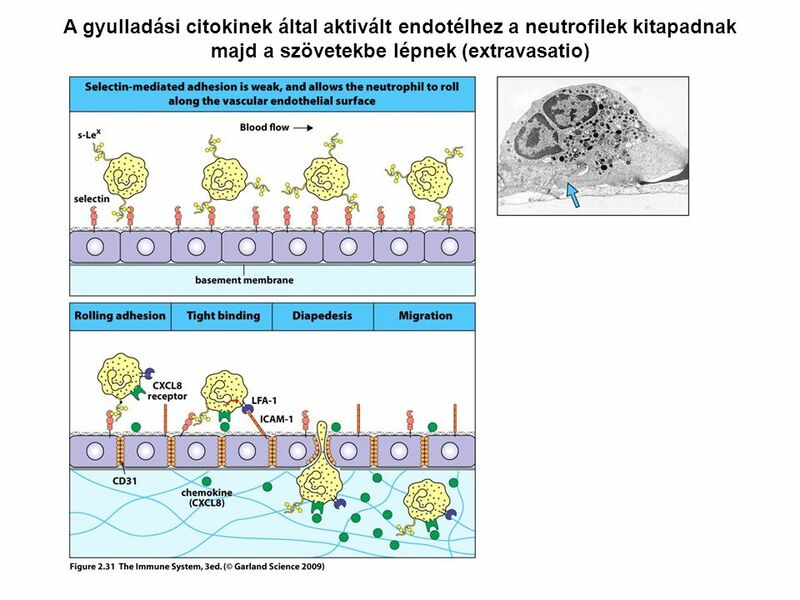 The bottom panel shows the conversion of rolling adhesion into tight binding and subsequent migration of the leukocyte into the infected tissue. 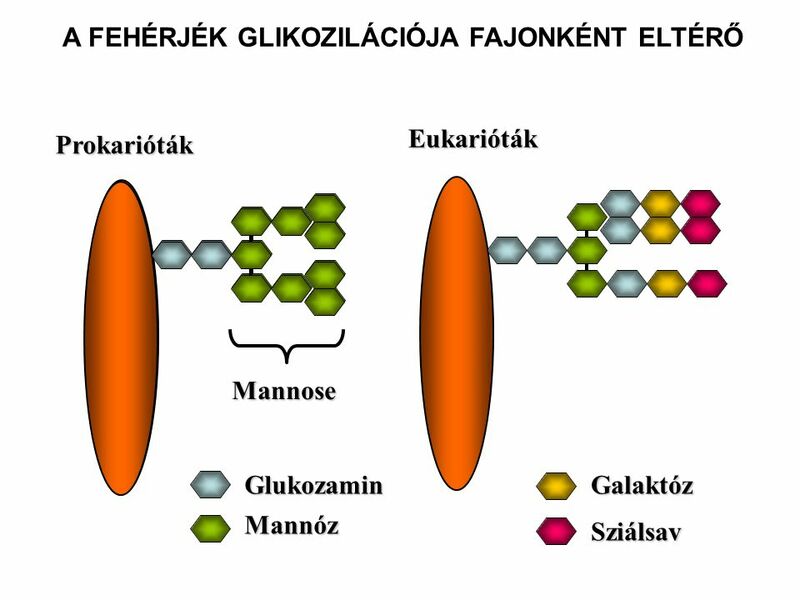 The four stages of extravasation are shown. 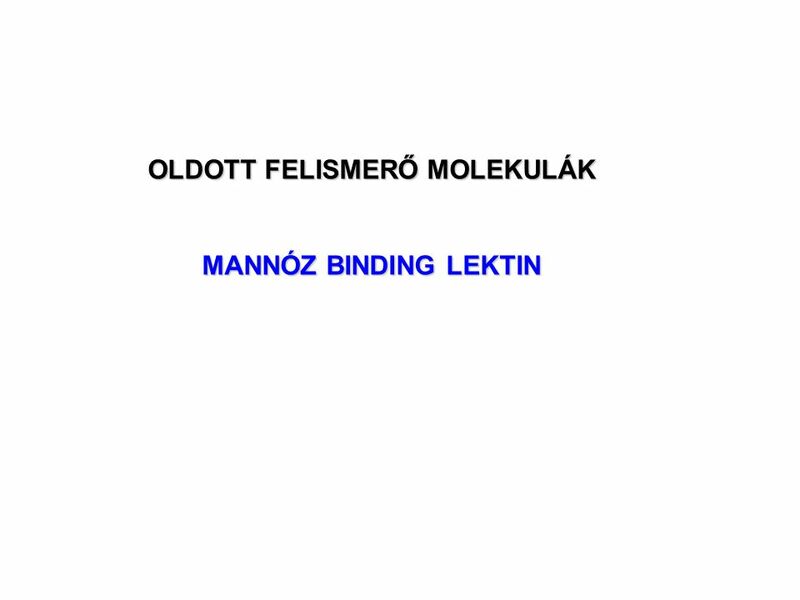 Rolling adhesion is converted into tight binding by interactions between integrins on the leukocyte (LFA-1 is shown here) and adhesion moleules on the endothelium (ICAM-1). 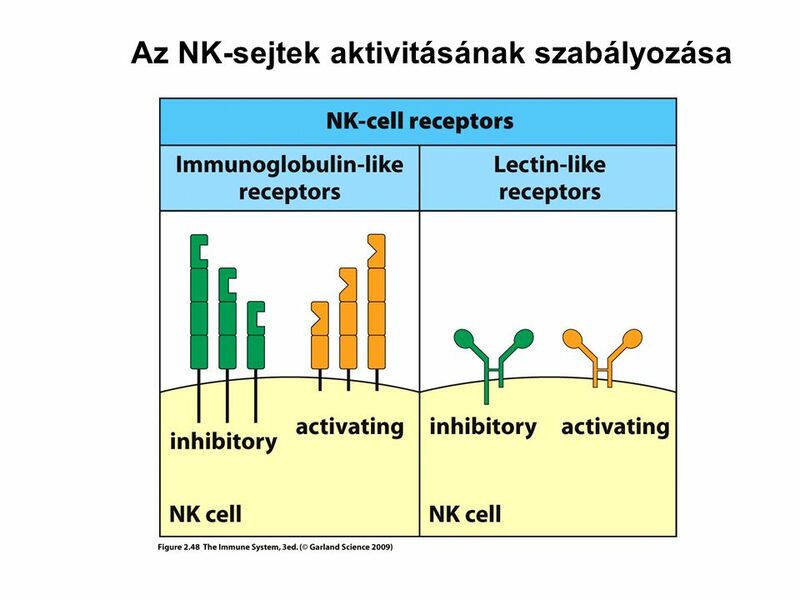 Expression of these adhesion molecules is also induced by cytokines. 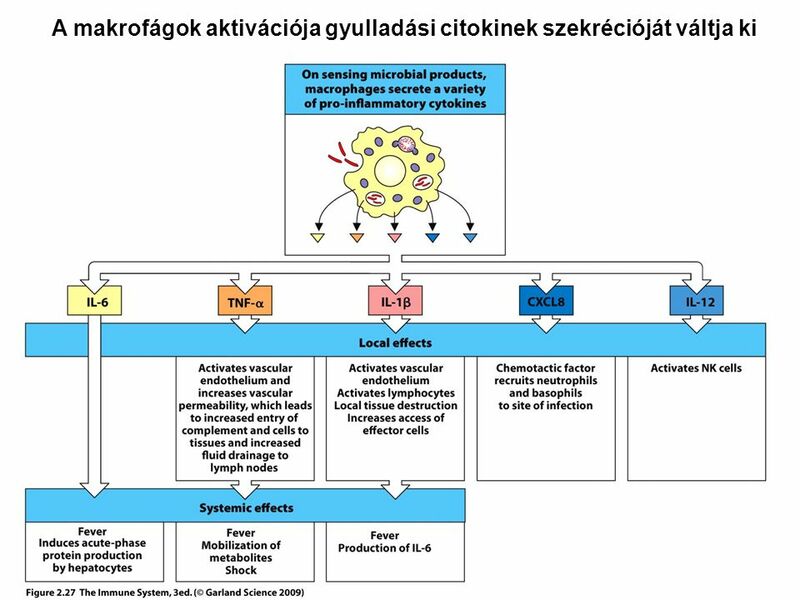 A strong interaction is induced by the presence of chemoattractant cytokines (the chemokine CXCL8 is shown here) that have their source at the site of infection. 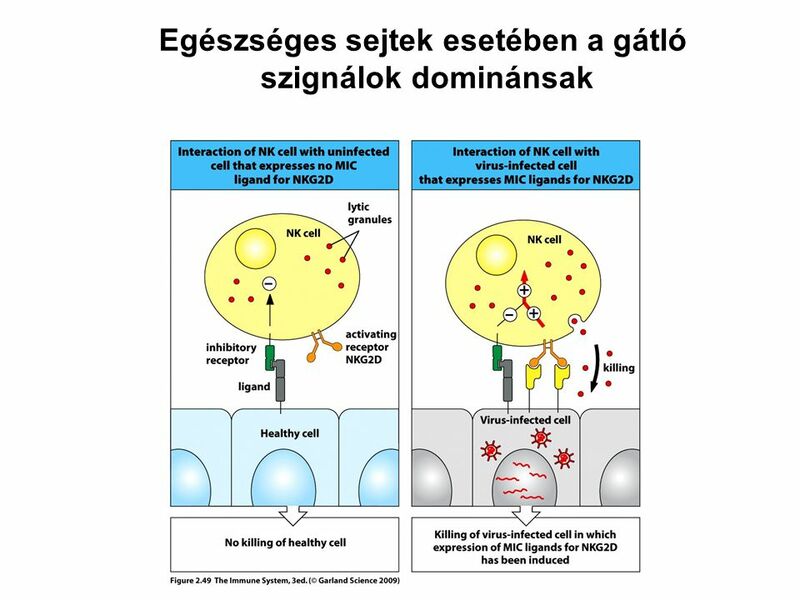 They are held on proteoglycans of the extracellular matrix and cell surface to form a gradient along which the leukocyte can travel. 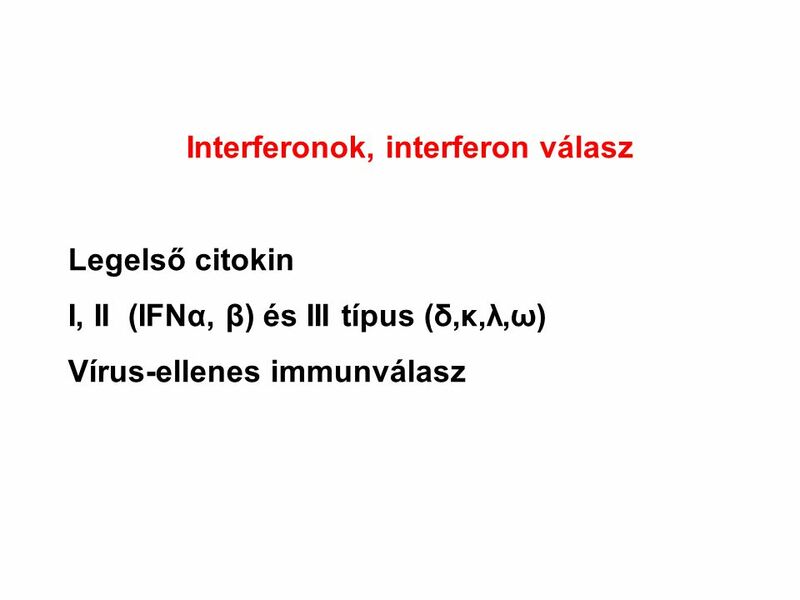 Under the guidance of these chemokines, the neutrophil squeezes between the endothelial cells and penetrates the connective tissue (diapedesis). 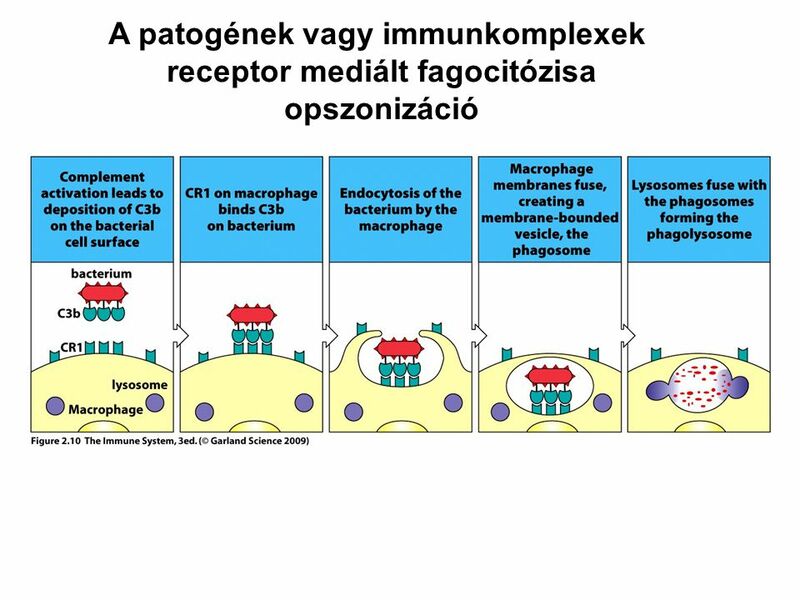 It then migrates to the center of infection along the CXCL8 gradient. The electron micrograph shows a neutrophil that has just started to migrate between adjacent endothelial cells but has yet to break through the basement membrane, which is at the bottom of the photograph. 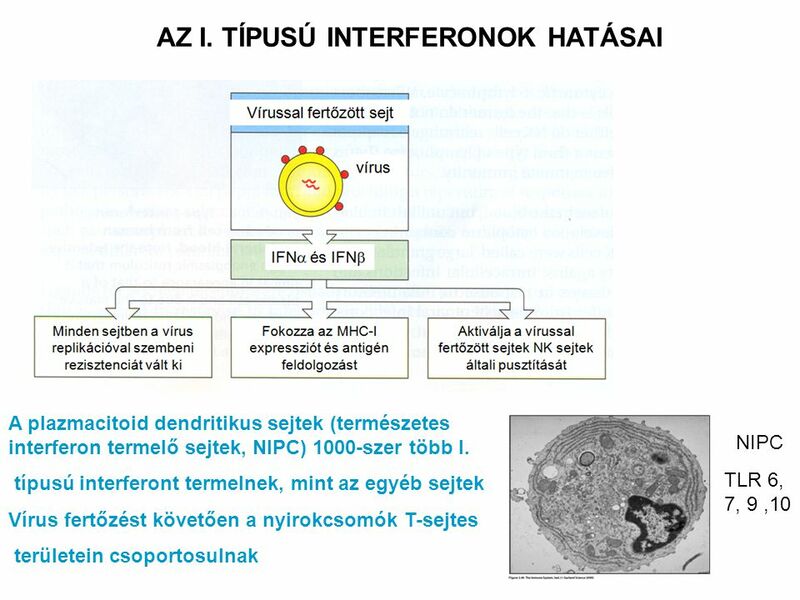 The blue arrow points to the pseudopod that the neutrophil is inserting between the endothelial cells. The dark mass in the bottom right-hand corner is an erythrocyte that has become trapped under the neutrophil. Photograph (x 5500) courtesy of I. Bird and J. Spragg. 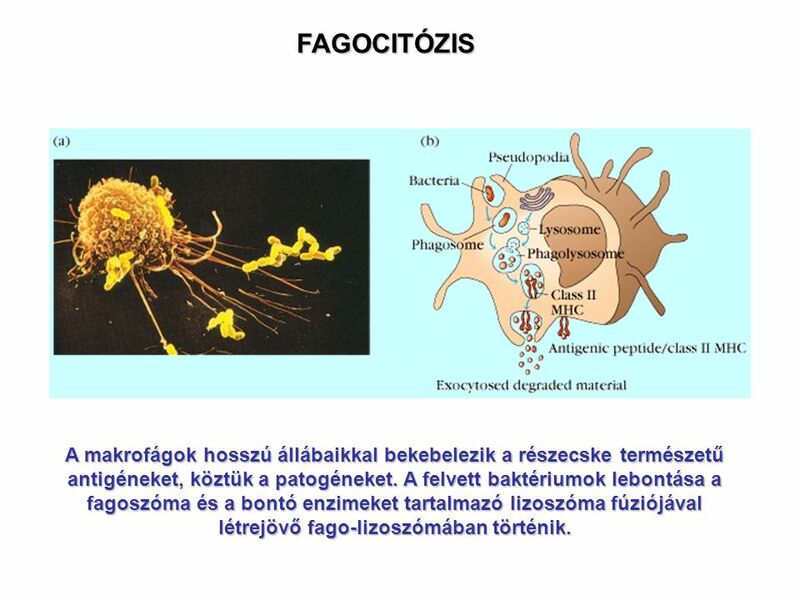 10 FAGOCITÓZIS A makrofágok hosszú állábaikkal bekebelezik a részecske természetű antigéneket, köztük a patogéneket. 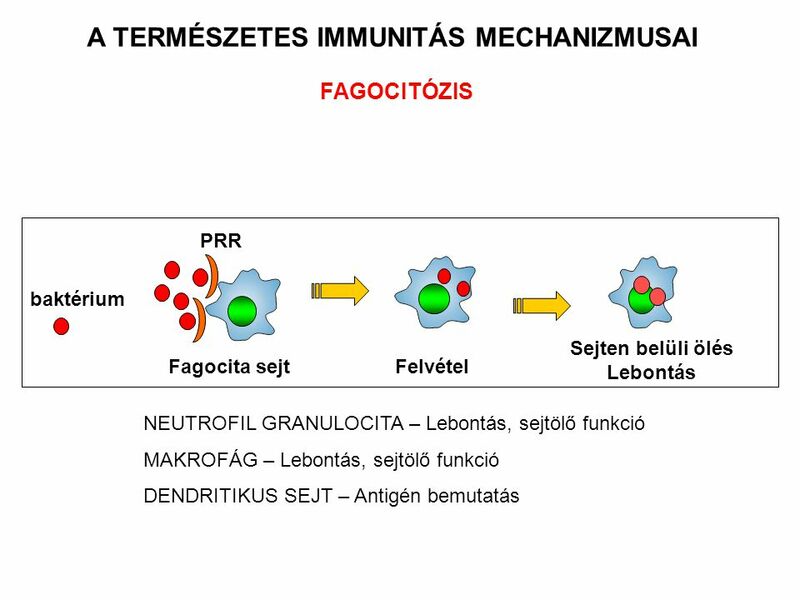 A felvett baktériumok lebontása a fagoszóma és a bontó enzimeket tartalmazó lizoszóma fúziójával létrejövő fago-lizoszómában történik. 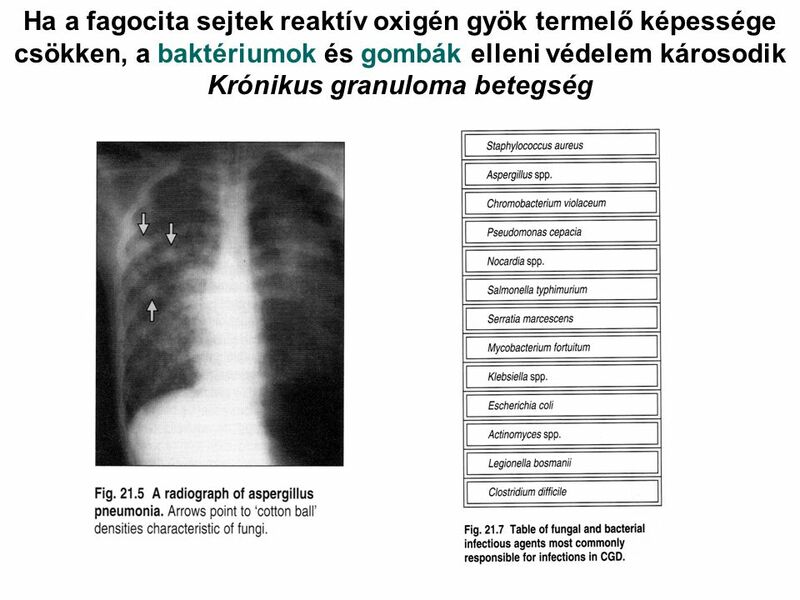 13 Gyököket (ROI) termel amelyek károsítják a baktériumokat. 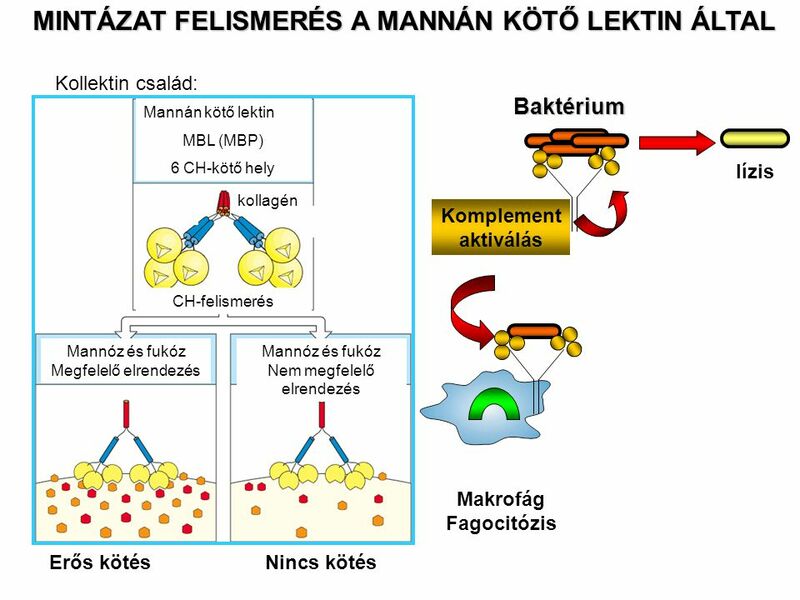 A fagocitákban található fagocita-oxidáz (Phox) enzim komplex reaktív oxigéntartalmú Gyököket (ROI) termel amelyek károsítják a baktériumokat. 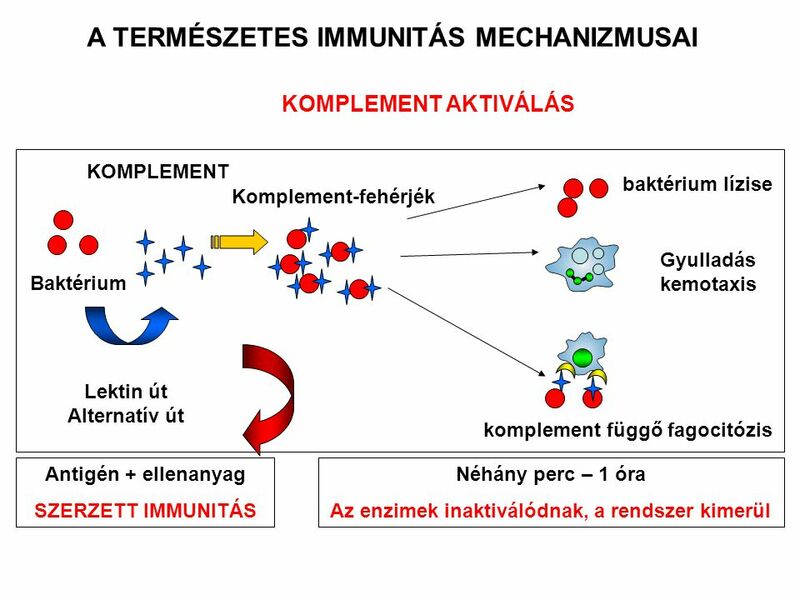 In the absence of infection the antimicrobial proteins and peptides in neutrophil granules are kept inactive at low pH. 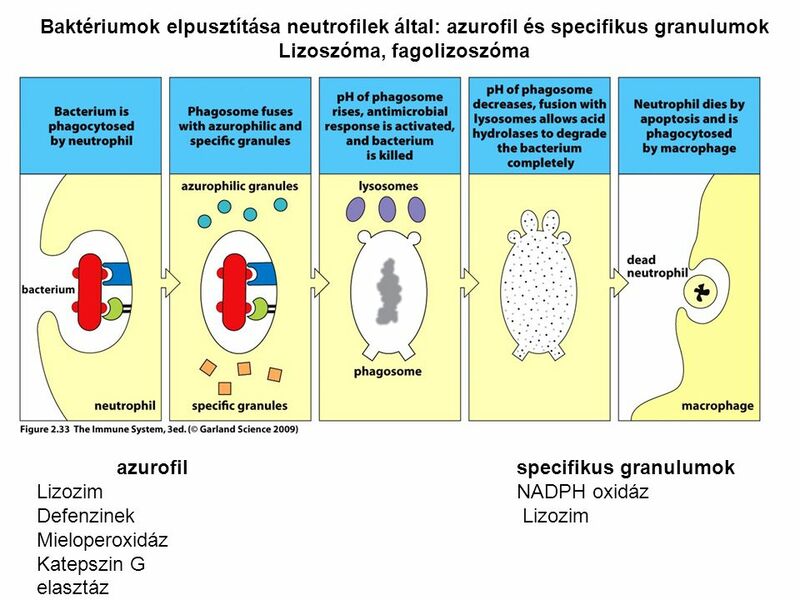 After the granules fuse with the phagosome the pH within the phagosome is raised through the first two reactions, involving the enzymes NADPH oxidase and superoxide dismutase. 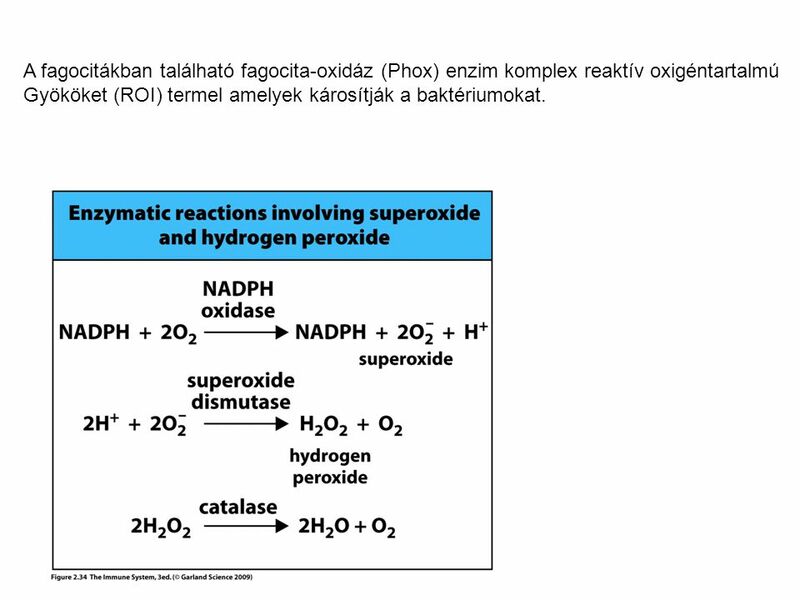 Each round of these reactions eliminates a hydrogen ion, thereby reducing the acidity of the phagosome. A product of the two reactions is hydrogen peroxide, which has the potential to damage human cells. (In hair salons and the manufacture of paper it is used as a powerful bleach.) 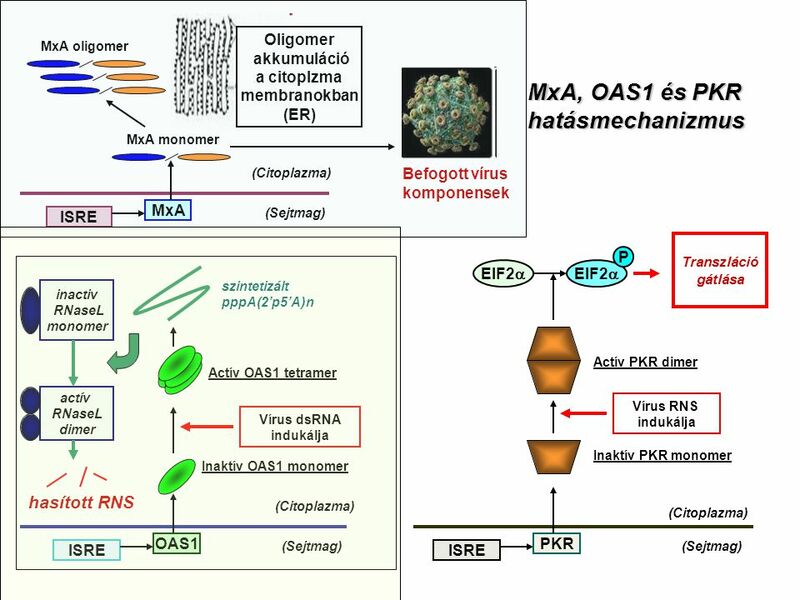 The third reaction, involving catalase, the most efficient of all enzymes, promptly gets rid of the hydrogen peroxide produced during the neutrophil's respiratory burst, raising the pH of the phagosome and enabling activation of the antimicrobial peptides and proteins. 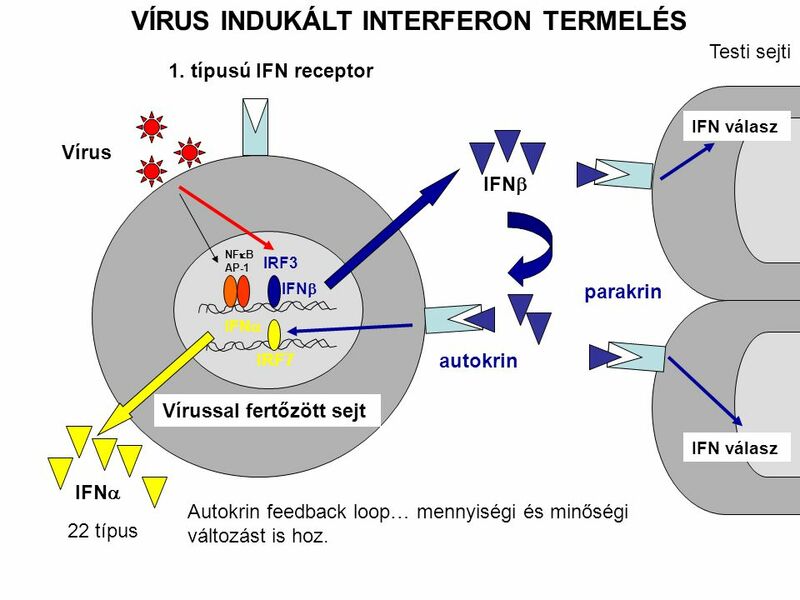 Testi sejti 1. típusú IFN receptor IFN válasz Vírus IFN NFB AP-1 IRF3 IFN parakrin IFN IRF7 autokrin Vírussal fertőzött sejt IFN válasz 22 típus IFN Autokrin feedback loop… mennyiségi és minőségi változást is hoz. 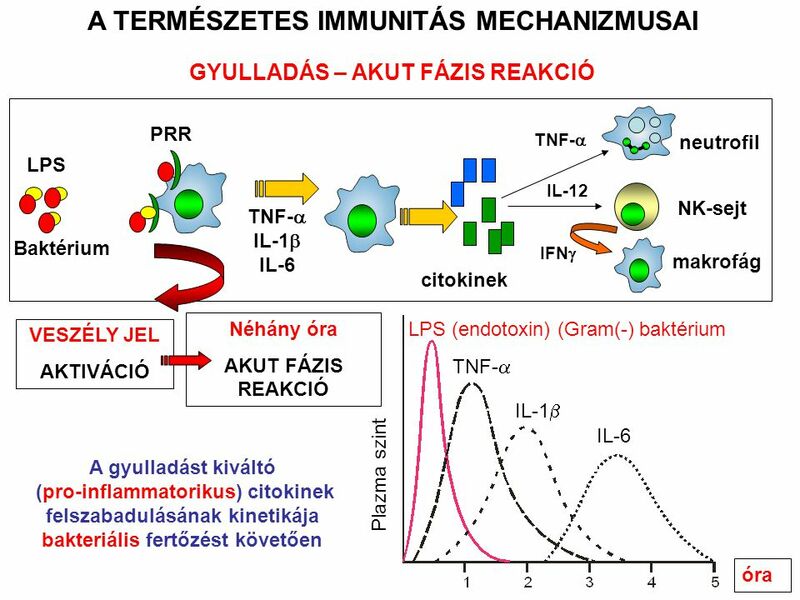 Letölteni ppt "A TERMÉSZETES IMMUNITÁS EFFEKTOR MECHANIZMUSAI"